My sister in law recently asked: ‘Why are people nicer on Facebook?’. That is quite a pertinent question given that so much of what we do and say is now available on social networks. So, is it true? Are we particularly nice on Facebook and, if so, why is that the case? Here is what I found. Is it true? Are we nice on Facebook? Apparently… yes. In response to a related question posted on Quora, Jeff Hammerbacher reported that the team developing Lexicon for Facebook found that wall posts and status messages on that social network were mostly positive. There are exceptions, of course. Cyber bullying comes to mind. 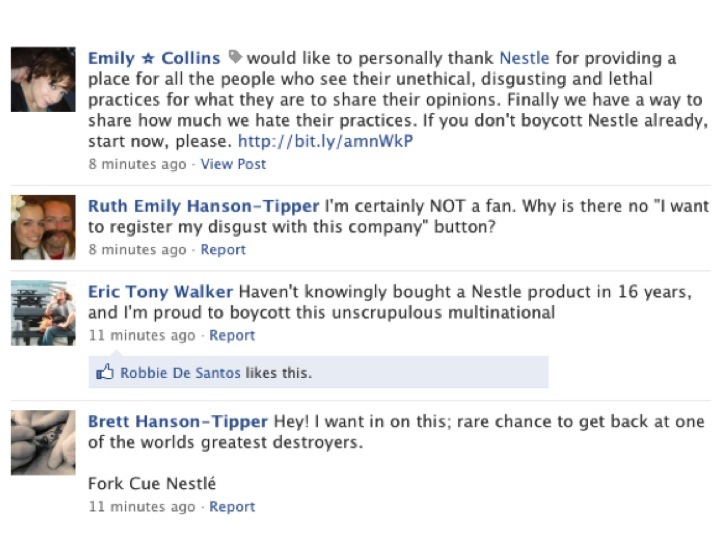 And Facebook users showed anything but love for Nestle over its use of palm oil. But… Why are we nicer on Facebook than when we talk face-to-face? Various reasons have been suggested, from self-censorship induced by the constant tracking of today’s society, to the threat of being ‘unfriended’ by someone who doesn’t like your comments. In this post, I suggest another reason: the fact that communication on Facebook is, mostly, asynchronous. – I update my status at 9h30m am. Before I did so, I thought about what I was going to write for a couple of minutes, and changed a word or two so that the message produces the desired effect – e.g., conveying how upbeat I am feeling this morning. – The time at which the message will be read is unclear and will vary with the recipient of the message. The opposite mode of communication is the synchronous one, where all the parties – i.e., producers and consumers of information – participate simultaneously. Examples include phone conversations and face to face negotiations. In such scenarios, people can still monitor what they say and how they wish to be perceived, but there is less time to do so. Indeed, failing to reply to what has just been said can in itself be a response that tells much more about what you are feeling than words would. It really makes a difference what we say, the words that come out of our mouth. I learned this from a woman who survived Auschwitz, one of the rare survivors. She went to Auschwitz when she was 15 years old and her brother was 8 and the parents were lost. She told me this. She said ‘We were in the train going to Auschwitz and I looked down and saw my brother’s shoes were missing. And I said “Why are you so stupid? Can’t you keep your things together? For goodness sake”. The way an elder sister might speak to a younger brother. Unfortunately, it was the last thing she ever said to him because she never saw him again. He did not survive. And, so, when she came out of Auschwitz, she made a vow. She told me this ‘I walked out of Auschwitz alive, and I made a vow’. And the vow was ‘I will never say anything that could not stand as the last thing I will ever say’. You can watch it in the video below, from minute 19.04 onwards (though I would truly recommend you watch it all). In asynchronous exchanges we loose some dimensions of communication – for instance, the use of voice inflections or hand gestures – and things may take longer to organise. Furthermore, this form of communication is not immune to impulse and misunderstandings, as illustrated by the e-mail exchange between Steve Jobs and Chelsea Isaacs. Most importantly, though, what does this all mean? Or in other words: So What? One implication is that asynchronous communication may be less genuine than synchronous one. However, it may also be more effective, because of the ability to plan what you want to say to ensure that the message is clear and not hindered by vocabulary or emotional limitations. For instance, research shows that customers have difficulty delivering bad news to members of staff with whom they have high-rapport. So, customers who want to express their frustration lean towards remote channels like letters or e-mail messages. Moreover, the two forms of communication described do not exist in isolation. Does being nice(r) on Facebook, build up goodwill that transfers to synchronous conversations? And how does the ubiquity of social networks’ status updates, micro-blogging, etc… affect communication and relationships in the business environment? What about you? Are you nicer on Facebook? Posted on February 10, 2011 July 25, 2012 by anacanhotoPosted in UncategorizedTagged Communication, Facebook. Nice topic. Here’s a slightly rambling reflection…. Teenagers./children are often not very nice at all on Facebook. As a mum, who is FB friends with a 13-year old, I observe an interesting mix of intense declarations of everlasting love (usually between female friends, but also between couples) and utterly nasty comments on appearance and behaviour. Which is further aggravated by incessant texting. I know of at least two fights (including broken nose) that resulted from FB comments. And those were 12-year olds…. But I think this probably supports the ‘synchronous/asynchronous’ argument: children/teenagers (and some childish adults – I’ve seen some terrible examples) often don’t think about the possible consequences when posting (writing) something. They treat FB commenting as synchronous conversation – simply mixed up with all the FB chatting and texting they do too. Where comments are meant to be hurtful, we are, of course, in the cyber-bullying domain, which is horrendous. I (thus) wouldn’t say asynchronous is thus less genuine – it ought to be more considered, which must be a good thing. So, less direct/spontaneous maybe, but maybe a better reflection of someone’s feelings and thoughts. Finally – I’m trying to be only friends on FB with people I like. So I don’t have to try hard to be nice. And I know better than to react on FB to any of the teenagers’ conversations – have seen other parents do it, and it generally just makes things worse. I do TALK to my daughter about it, though. Yes, I agree. Though, unfortunately, these exchanges could also be a case of cyber-bullying, where the technology is merely another stage for the nasty behaviour. I have started to see some folks do FB well and I like their approach – but I haven’t always noticed that people are more friendly – and its certainly not deep and purposeful. As I say – Im hopeless on FB. But then I do dislike/distrust everything about the platform. The dynamics on FB did change with the more people joining it (or friending you) – and, yes, there are lists and so on, but it is just too much trouble, don’t you think? I suspend my judgement – here goes…. These 2 to 3 word phrases are called long tail keywords. mainly because I concentrate on Organic Optimization and its way too time-consuming and intensely challenging to fake organic backlinks. There is an increased demand for pure SEO services inspite of the emergence of automatic software nowadays.